A recent study reveals that users of smartphones utilize their phones primarily for accessing mobile apps rather than browsing the net. Flurry, is a mobile analytics firm tracks the usage of more than three hundred thousand apps on more than a billion active mobile devices. Based on their data, an astounding eighty percent of mobile usage is used on apps. 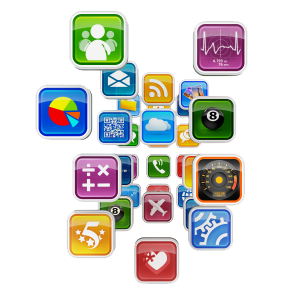 We are just not talking about social media or game applications but all categories of mobile applications. • Smartphones and tablets – With the increasing market demand for mobile devices like smartphones, tablets, and other media devices, mobile applications will also continue to thrive. Since 2011, smartphone and tablet shipments have exceeded those of desktop and laptop shipments and this plays a key role in heavy app usage. • Application markets – With the fierce rivalry between Android and IOS with regards to control of the application market, both have been able to provide a platform for the mobile phone users to avail of free mobile applications. • No Internet connection required – The popularity of mobile apps stems from its ability to be accessed without the use of the Internet. Although some mobile apps require interconnection for them to be opened, a majority of the consumers uses mobile apps that do not need the Internet unlike the web browser. • Straightforward Functionality – With just one click you may be able to use the app right away. Apps that are being used daily and useful for both work and play are easily accessible. • Time usage – More and more users are now accessing their Twitter and Facebook accounts, play mobile games longer and generally use their smartphones or tablets more as compared to the previous years. With the staggering results revealed by Flurry, more and more companies are now deliberating whether to develop a mobile website or a mobile application. Although this may seem the same to some people, both mobile websites and mobile apps have different benefits and serve different target markets. The knowledge of how mobile websites work compared to mobile apps could help you determine what’s more suitable for your business. • They can be accessed easily by a simple search from the browser while apps have to be downloaded and then installed before you are able to use it. • They can be compatible with any mobile device whereas apps require separate versions for each type of device. • They are updated automatically whereas application software will depend on the user and they would have to be downloaded in order to upgrade the app. • URLs of mobile websites can be easily shared through a simple link to an email or any social media site. You cannot share apps in this method. • Ideally used if your regular target users are using your app in a more personalized fashion on a daily basis (Evernote, for example). • Convenient for users who use computations, spreadsheets, charts or reports for their businesses. • Provides other features that users may need like VoIP service, SMS and GPS integration. Evernote Food 2.0 Has Launched On Android For Food Lovers!